Excited didn't quite cover it. I had this on my nail within five minutes of it arriving! And it did not disappoint. Ruby Pumps from the revived Wizard of Ohh-Az collection has long been a favourite of mine and of nail bloggers all over the sphere so I'm very excited now to own this. My high expectations were not let down when I finally got to try this shade - it is beautiful! On first application it is a little more watery than I would of liked and even looks rather pink instead of the deep red I was hoping for - but never fear! 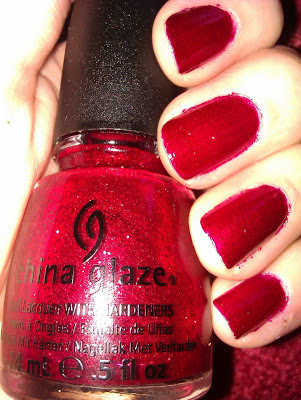 After two or three coats the deep red and never ending glitter was there. It was so pretty I couldn't stop looking at my hands! And I got so many compliments on the colour- it's not a regular thing for my friends to notice my nails when they are nail art free so that just shows how eye catching and gorgeous this shade is! Wear wise I was slightly disappointed, I was expecting professional long lasting non chip etc but despite the fact that I applied it first on Saturday morning, with an extra coat before I went out Saturday night, by Monday morning the tips were chipped and by the evening half of my thumb nail had chipped off!! I'm hoping that this was because I used the CG Fast Forward top coat instead of a no chip long lasting top coat but either way I was so upset to have to remove this polish. 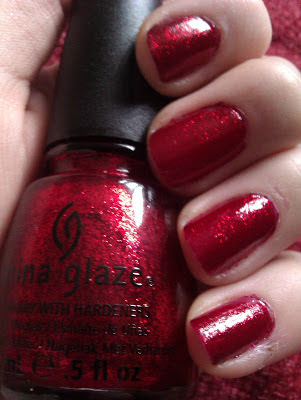 So overall - perfect colour for red and glitter lovers, lets the side down a bit by not wearing well. Still my favourite colour I own though. As for the photographs, the glitter really doesn't show with the flash so for a more true to life colour, but which still doesn't quite capture the beauty of the shimmer. Wow, love this one and I'm usually not a big fan of reds. Yeah I don't often wear red but couldn't resist this one! I think it was the hype that made me buy it too - so many bloggers saying "this is my favourite red ever!" so I thought what better way to start a China Glaze collection?! I thought it was the perfect way to discover a new brand :) have you got many china glaze polishes now?